I love my blog. I like that it lets me write about things I enjoy doing, that it's somewhere that I can keep my hand in writing-wise - I'm a firm believer in Neil Gaiman's principle that to be a good writer you have to write something as often as possible - and that it gives me somewhere to express myself. I've always been someone who did my blog for me and I've never really had the desire to had advertising or sponsored posts or anything like that (though if anyone out there is reading it those wouldn't necessarily be bad things! ), but as I'm hoping to build a career that somehow involves writing I'm aware that upping that online presence can't hurt. 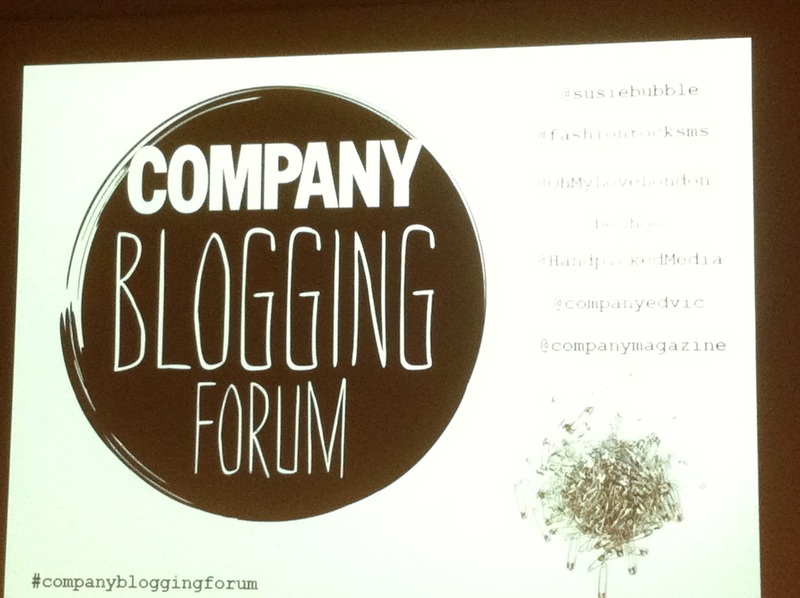 So, with that in mind, last night I went along to the Company magazine blogging forum at King's College London. I'm a big fan of Company and really admire that they do decent, relevant journalism for young women - so many other magazines just seem to recycle the same three stories but there always seems to be something different with every issue of Company I pick up - as well as that they have really lovely, affordable fashion that I genuinely want to buy unlike some publications where I'll look at a fashion spread and all I can afford is a hairband. In the past eighteen months or so the magazine has made a big push to embrace blogging and as such there are lots of cool new ideas coming out of it, and the forum is designed to bring bloggers together as a networking tool as well as allowing key industry players to share their knowledge and tips. I have to say I was incredibly nervous at first because I was there on my own and most people seemed to know everyone else so there was a little bit of standing around looking awkward and trying not to neck the free champagne. Plus I made the foolish mistake of thinking that as it was cold a jumper, jeans and Converse was a perfectly acceptable outfit for an event full of fashion bloggers - by the time I got there I was kicking myself for not wearing a dress. But as the evening wore on people were lovely and friendly and quite happy to talk to me, which was something I really liked; it was nice to feel included despite not having taken many steps into the blogging community before this event. Once we got into the actual forum the format was questions from Company editor Vic to Susie Lau (aka the blogging legend that is Susie Bubble), Rhiannon at Fashion Rocks My Socks, Krista from Handpicked Media (a company that represents bloggers and other digitial content producers), Roxanne from Boohoo and Sally at Oh My Love about anything and everything to do with blogging, as well as questions from the audience. It was actually really good in that it was very much aimed at people who were starting out in the blogging world, or certainly those who hadn't got to the stage where their blogs were full-blown commercial entities, which is what I was worried it was going to be. But from the questions it seemed to be that most people were very much new to the blogging game or certainly weren't making serious money for them, so it was nice to know we were all in the same boat. I was lucky enough to get a question answered in the Q&A, about how to keep your blog current if you're not blessed with deep pockets or companies giving you stuff for free, as that is something I have always worried puts people off about my blog in that I write about stuff that's been around for years or that you can't get any more, and I have to say the advice from the whole panel was fantastically helpful. The big takeaway for me was that it is all about content and making sure that your voice comes through, which I like to think is something I manage to do quite well (though of course please feel free to tell me differently, I'm always looking out for ways to improve!). I also got some ideas for how I might develop the blog, including a possible migration to Wordpress and a possible 'niche' for me to keep the mix of stuff I have going and turn one of the things I thought was a drawback into an asset, as well as maximising my online presence but not being too full-on. I do have an Instagram account but am now not sure how much it's worth it, as I did agree with Krista's point that it is quite annoying when people's Twitter feeds are just full of their Instagram posts (and I know I've been guilty of that with other apps in the past). Maybe Tumblr might be a better option, or indeed just sticking with Twitter as I'm not much of a picture person - the majority of my posts tend to be text-based anyway, and I actually prefer using Twitter for pictures as it means not having to open a separate link. I should also add that we got the most amazing goody bags - I haven't fully been through it yet but there's dry shampoo (oh Batiste, how I love you), a couple of snacky treats including an amazing-looking chocolate soya milk dessert, stickers, ginger beer, leave-in conditioner, make-up remover pads, the most beautiful Temperley for Filofax organiser and a copy of the magazine. No doubt I missed something but it was so incredibly generous and there is definitely stuff in there I shall be blogging about in the future. If you're looking to start blogging or want to know how to develop your own blog, I really cannot recommend the blogging forum highly enough. I have to admit I did initially balk a little at the price - it's £25 a pop - but for the sheer amount of advice you got, the panellists' willingness to answer even the dumbest of questions (mine, I should hasten to add), the opportunity to meet so many great bloggers and the extras, it was definitely worth it. This was their third but unfortunately I'm not sure if it's annual or twice a year; however, I shall keep a weather eye out for news of the next one and keep you posted. Great write-up, really summed up the evening! Jeans, jumper and converse is exactly the thing to wear to these conferences - fashion is a form of expression and if that's what you're comfortable in then do it! I worse OTT clashing prints - totally fashion crime I know - but that's me. Really, what I'm trying to say here is... you go girl! Beauty Review: China Glaze Ahoy!